Comb-pattern Pottery.This object with a pointy bottom was discovered in Amsa-dong, Seoul, a representative historic site of the Neolithic Age. The history of the Korean nation began in Manchuria and the Korean Peninsula when people started settling there 700,000 years ago. Representative historic sites associated with the people of the Paleolithic Age, who used tools made of animal horns and chipped stone tools, include Geomeunmoru Cave in Sangwon, Pyeongannam-do Province; Jeongok-ri in Yeoncheon, Gyeonggi-do Province; Seokjang-ri in Gongju, Chungcheongnam-do Province; and Durubong Cave in Cheongju, Chungcheongbuk-do Province. The early inhabitants of the peninsula survived by hunting for animals and collecting edible plants in groups. In Korea, the Neolithic Age began around B.C.8,000. People started farming, cultivating cereals such as millet, and used polished stone tools. They started settling down permanently in places and formed clan societies. One of the most representative features of the Neolithic Age is combpatterned pottery, examples of which have been found all across the Korean Peninsula, including Amsa-dong, Seoul; Namgyeong, Pyeongyang; and Suga-ri, Gimhae. Hand Axe.This multifunctional tool dates back to the Paleolithic period, it was discovered in Jeongok-ri, Yeoncheon-gun, Gyeonggi-do. The Bronze Age started around the 10th century BC on the Korean Peninsula and the 15th century BC in Manchuria. Historic sites associated with the Bronze Age are found in Liaoning and Jilin Provinces, China and across the Korean Peninsula. With the development of the Bronze culture, a society emerged in which the head of a clan exercised great influence. The strongest clan leaders started merging many clans into one, and these groups very gradually developed into early states. The tribes that played a central role in the establishment of Gojoseon, which emerged as the first recognizable state of the Korean people, believed in the King of Heaven and worshipped bears. The two factions jointly upheld Dangun Wanggeom as their chief priest and political leader. Gojoseon fostered an independent culture in Liaoning, China and along the Daedonggang River. By the 3rd century BC, kings such as King Bu and King Jun had become powerful and bequeathed the throne to their sons. They established a solid system of rule, backed by high-ranking retainers and military officers. Towards the end of the 3rd century, the Qin Dynasty was replaced by the Han Dynasty in China, creating a period of social upheaval. Many people moved southward to Gojoseon. Their leader, Wiman, acceded to the throne in B.C. 194 and Gojoseon expanded its territory under his rule. By this time, Gojoseon had adopted iron culture, developed agriculture and various handicrafts, and increased its military strength. It tried to monopolize profit, while serving as an intermediate in the trade between the Korean Peninsula and China, taking advantage of its geographical proximity to China. This led to confrontation between Gojoseon and Han China. Han attacked Gojoseon with a large number of ground and naval forces. Gojoseon defiantly resisted the attack and won a great victory in the early stage of the war, but its capital at Wanggeomseong Fortress fell after a year of war, and Gojoseon collapsed in B.C. 108. The Seven Wonders of the World include sites such as the Great Pyramid of Giza, the Great Wall of China, and Stonehenge in England among others. However, Korea’s dolmens are no less mysterious. About half of all the dolmens in the world or around 40,000 dolmens are found on the Korea Peninsula. Diverse artifacts, including human bones, stone objects, and jade and bronze artifacts, have been unearthed from the dolmens, although how such large stones were transported and built at that time still remains a mystery. In the past, the dolmens in Korea used to be classified into two categories: the northern type (table type), which includes the dolmens located north of the Hangang River, and the southern type (go-table type). However, after go-table dolmens were found north of the Hangang River, and tabletype dolmens were found south of the river, the northern/southern-type appellations were dropped. Meanwhile, other scholars have added new types to this system of classification. In the early 20th century, American missionary Horace Grant Underwood claimed that dolmens were not tombs but rather that they were put there for sacrificial rituals offered to the gods of the earth. A Korean folklorist named Son Jin-tae pointed to a folktale in which dolmens were believed to be the houses of witches (Mago halmeoni in local legends). Dolmens are rarely found in China, except for Manchuria, or Japan, yet many thousands of them can be seen across the Korean Peninsula. They were erected over many thousands of years, but this process stopped sometime before Christ. There are many unsolved mysteries surrounding the dolmens, such as the reason for their concentration in such great numbers on the Korean Peninsula in Northeast Asia and their connectivity with those found in Europe or India. UNESCO’s acceptance of the South Korean government’s application for registration of the dolmens in Ganghwa, Hwasun, and Gochang in 2000 as a world cultural heritage attests to the world’s growing interest in their importance in the field of cultural anthropology. Towards the end of the Gojoseon Period, tribal states came into being one after another in Manchuria and on the Korean Peninsula. Buyeo was established in the plains along the Songhuajiang River in Manchuria and Jilin. The people of Buyeo grew crops and raised livestock, including horses. They also made furs. By the early 1st century AD, they started calling their main leader the King and actively engaged with other countries, even entering into diplomatic relations with China. By the end of the 3rd century, Buyeo had been incorporated into Goguryeo. The people of Buyeo held an annual festival called Yeonggo in December. During the festival, they held a sacrificial rite for heaven, sang and danced together, and released prisoners. The Kingdom fell apart during the establishment of the regional confederation, but the factions that founded Goguryeo and Baekje took pride in their status as the inheritors of Buyeo. Samguk sagi (History of the Three Kingdoms) states that Gojumong, who founded Goguryeo in B.C.37, was originally from Buyeo. Goguryeo prospered greatly in areas close to Baekdusan Mountain and along the Amnokgang (Yalu) River. Right after its foundation, the Kingdom conquered a number of small states in the area and moved its capital to Gungnaeseong (Tonggu) near the Amnok. Through many wars, it drove away the factions loyal to Han Dynasty and expanded its territory as far as Liaodong in the west and to the north of the Korean Peninsula in the east. It became a powerful state, exerting control over Manchuria and the northern part of the Korean Peninsula. There were also a number of small states, such as Okjeo and Dongye,in present-day Hamgyeong-do Province and the north of Gangwon-do Province along the East Coast of the Korean Peninsula. Located in outlying areas, they did not develop very rapidly. Okjeo offered tributes, such as salt and fish, to Goguryeo. The people of Dongye held a sacrificial rite for heaven called Mucheon in October, building a spirit of collaboration by singing and dancing together. Their specialty products included an archery bow, known as a dangung, and the gwahama (a horse small enough to pass unhindered beneath fruit trees). These two states were also incorporated into Goguryeo. The area to the south of Gojoseon was occupied by a large group of small states including Mahan, Jinhan, and Byeonhan. Mahan was a confederacy of fifty-four small states (composed of 100,000 households in total) located in present-day Gyeonggi-do, Chungcheong-do, and Jeolla-do Provinces. Byeonhan was located in an area that included present-day Gimhae and Masan. Jinhan was located in an area that included present-day Daegu and Gyeongju. Each of the latter two was composed of 40,000 – 50,000 households. The three mini-states were collectively known as Samhan (Three Han States). The people of Samhan held rites of sacrifice for heaven in May and October. On such occasions, they gathered together to enjoy liquor, food, singing and dancing. Along with the spread of iron culture and the development of farming skills, powerful states such as Goguryeo, Baekje and Silla gradually became established in Manchuria and the Korean Peninsula. Goguryeo was the first of the three Kingdoms to firmly establish itself as a sovereign country. It started expanding its territory in the late 1st century and adopted a system centered on the King by the late 2nd century. By the early 4th century, King Micheon of Goguryeo had driven away factions loyal to Han Dynasty from the Korean Peninsula. In 372 (the 2nd year of King Sosurim’s reign), Goguryeo adopted Buddhism and announced a code of laws in an effort to establish a proper ruling system. It also established the Taehak, a Confucian educational institute. King Gwanggaeto the Great, a son of King Sosurim, drove away the Khitan, Sushen, Dongbuyeo and expanded his territory into Manchuria. He also captured many of Baekje’s fortresses in the south and helped Silla overcome a crisis by driving away Wako invaders. Baekje was established in B.C.18 jointly by the people who lived along the Hangang River, people originating from Buyeo and Goguryeo, and migrants from elsewhere. By the mid-3rd century, during the reign of King Goi, the Kingdom had seized complete control over the areas along the Hangang River and established a solid system of political governance by accommodating the advanced culture of China. By the mid-4th century, King Geunchogo occupied Mahan and expanded the territory as far as the south coast of present-day Jeollanam-do Province. Along the northern border, Baekje confronted Goguryeo in a bid to take control of present-day Hwanghae-do Province. It also exerted control over Gaya in the south. At that time, Baekje’s territory included present-day Gyeonggi-do Province, Chungcheong-do Province, Jeolla-do Province, the middle reaches of the Nakdonggang River, Gangwon-do Province, and Hwanghae-do Province. King Gwanggaeto the Great, the 19th king of Goguryeo, expanded the territory of his Kingdom into Manchuria and the Maritime Provinces of Siberia. In 414, his son King Jangsu set up a stele (6.39m high, 37 tons) in present-day Jian, Jilin Province, China to commemorate his father’s great achievements. The inscription, comprising 1,775 characters, explains how Goguryeo was founded and how it expanded its territory. Silla originated in Saroguk, one of the mini states of Jinhan. It was established as a Kingdom in B.C.57 by the natives of present-day Gyeongju and people from other regions. Those with the family names Park, Seok, and Kim acceded to the throne in turn. By around the 4th century, the Kingdom occupied most of the areas east of the Nakdonggang River. During the reign of King Naemul, Silla allowed Goguryeo troops to remain within the Kingdom to help drive away Wako invaders. It also adopted Chinese culture and civilization through Goguryeo. This crown was unearthed in Goryeong, Gyeongsangbuk-do. It features upright decorations and curved jade pendants. In Byeonhan, located along the lower reaches of the Nakdonggang River, the Gaya Confederation emerged, with Geumgwan Gaya playing a leading role. The confederation developed an iron culture and exerted considerable influence on areas along the Nakdonggang River. Mini states of Gaya started rice farming early on and traded actively with Wa (Japan) and Lelang, taking advantage of locally produced iron and convenient sea routes. This precious object has helped researchers broaden their understanding of the production skills, handicrafts, artistic culture, religion, and ideas of Baekje. By the 5th century, each of the three Kingdoms (Goguryeo, Baekje, and Silla) on the Korean Peninsula was committed to a policy of territorial expansion under a firmly established ruling apparatus centered on the King. In Goguryeo, King Jangsu, a son of King Gwanggaeto, moved the capital to Pyeongyang in 427. He occupied Hanseong (present-day Seoul), the capital of Baekje, and areas along the Hangang River, expanding his territory down to present-day Jungnyeong Pass (Danyang and Yeongju) and Namyang-myeon, Gyeonggi-do Province. Thanks to this territorial expansion, Goguryeo emerged as a power to be reckoned with in Northeast Asia. Looking at Baekje, the Kingdom moved its capital to Ungjin (present-day Gongju) in 475, after yielding the areas along the Hangang River to Goguryeo. It strived to rebuild its strength to regain the lost territory. King Dongseong confronted Goguryeo by reinforcing the alliance with Silla. King Muryeong reinforced local control in an effort to lay the foundation for prosperity. King Seong, a son of King Muryeong, relocated the Baekje capital to Sabi (presentday Buyeo), strove to reform the ruling system, and regained control over areas along the Hangang River in an alliance with Silla. As for Silla, Saroguk changed its name to Silla in the early 6th century, reformed its political system, and reorganized its administrative zones, including the capital, during the reign of King Jijeung. King Jijeung incorporated Usanguk (composed of present-day Ulleungdo and Dokdo) into Unified Silla and Balhae (8th Century) the territory of Silla in 512. King Beopheung stabilized the ruling system by proclaiming laws, setting rules about official robes, and adopting Buddhism as the official state religion. He also incorporated Geumgwan Gaya in a drive to expand the territory. King Jinheung reorganized Hwarangdo into a national organization and expanded the territory considerably. He seized lands along the Hangang River from Baekje, conquered Dae Gaya in Goryeong, wrested areas along the Nakdonggang River, and expanded the territory as far as Hamheung along the East Coast. In 612, Sui China, which unified all of mainland China into one state, attacked Goguryeo, mobilizing more than a million troops. General Eulji Mundeok of Goguryeo drowned most of the Chinese invaders in the Salsu (present-day Cheongcheongang River). The Sui Dynasty sustained enormous damage due to the failure of the campaign and fell to the Tang Dynasty in 618. Tang China also attacked Goguryeo several times, but failed at each attempt. In the meantime, Baekje frequently attacked Silla. Silla unsuccessfully sought the assistance of Goguryeo, and then invaded in an alliance with Tang China. Silla troops led by Kim Yu-sin defeated an elite force of Baekje troops commanded by Gyebaek in Hwangsanbeol and marched to Sabi, the capital of Baekje. Troops of Tang China invaded Baekje through the estuary of the Geumgang River. Finally, Baekje surrendered to the Silla-Tang forces in 660. The Silla-Tang forces then attacked Goguryeo, once the most powerful Kingdom in Northeast Asia. However, Goguryeo had depleted its resources in two large-scale wars against the two dynasties of China, and fell in 668. Upon conquering Baekje and Goguryeo in alliance with Silla, Tang China attempted to exert control over the entire Korean Peninsula, including Silla. Silla waged a war against Tang, defeated its navy in Gibeolpo near the estuary of the Geumgang River, and drove all of Tang’s forces out of the peninsula, thus accomplishing the important feat of unifying the Korean Peninsula in 676. With the unification of the three Kingdoms on the Korean Peninsula in 668, Silla enjoyed a marked expansion of both its territory and population. Unified Silla entered a period of dazzling economic development. It mended fences with Tang China. The two countries saw vigorous exchanges between traders, monks, and Confucian scholars. Silla exported gold/silver handiworks and ginseng to Tang and imported books, chinaware, satin silk fabric, clothes, and craftwork products. Goods from Central Asia were introduced to Silla, and traders from that region paid visits to Silla via the Silk Road and sea routes. 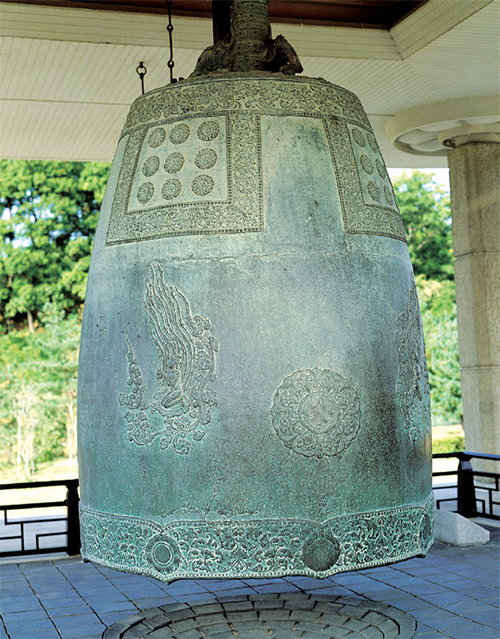 Weighing 18.9 tons, this is the largest bell in the country. It is also called the Emille Bell. The Flying Apsaras in the picture on the right displays the exquisite decorative skills of Silla. The major ports of Silla included Ulsan and Danghangseong (present-day Hwaseong, Gyeonggi-do Province), through which numerous goods from Central and Southern Asia were imported. In the early 9th century, General Jang Bo-go of Silla established a forward base in Cheonghaejin (presentday Wando, Jeollanam-do Province) to deal with the pirate menace and encourage trade with nearby countries including China and Japan. In the meantime, the survivors of the fallen Kingdom of Goguryeo resisted Tang China’s rule. In 698, a group of them led by Dae Jo-yeong, jointly with the Mohe, founded Balhae near present-day Dongmiaoshan in Jilin Province, China. The new Kingdom would eventually confront Silla in the south. Balhae started expanding its territory and regained control over most of the former territory of Goguryeo. During the reign of King Mu, Balhae controlled northern Manchuria. King Mun reformed the system of governance and moved the capital to Sanggyeong (present-day Ningan-xian, Heilongjiang Province) in about 755. The people of Balhae took pride in their Goguryeo inheritance. Letters held in Japan show that the kings of Balhae referred to themselves as the Kings of Goguryeo. Balhae eventually grew so large and strong that the people of Tang China called it Haedong seongguk (“prosperous country in the east”), but it fell in 926 as a result of the devastation caused by an eruption of Baekdusan Mountain and an invasion of the Khitan. By the late 8th century, Silla had been weakened by an internal struggle for power among the nobility; and, by the 10th century, leaders of powerful local factions, such as Gyeon Hwon and Gungye, had established their own regimes. In 892, Gyeon Hwon established a Kingdom named Later Baekje, with Wansanju as its capital, and gained control of present-day Jeolla-do Province and Chungcheong-do Province. In 901, Gungye, a member of the Silla royal family, founded Later Goguryeo, exerting control over present-day Gangwon-do Province and Gyeonggi-do Province. He expanded the territory, reformed the ruling system, and relocated the capital to Cheorwon. He also changed the name of the country to Taebong. Gungye lost popularity among his people while exerting control over local leaders and strengthening his claim to the throne. In 918, he was driven away by Wang Geon, a local leader from Songak. Wang Geon changed the name of the country to Goryeo, announced that the country would inherit Goguryeo, and moved the capital to Songak. Goryeo remained hostile to Later Baekje and adopted a policy of positive engagement with Silla. In 935, Unified Silla was peacefully incorporated into Goryeo. Following a power struggle among leaders in Later Baekje, Gyeon Hwon surrendered to Wang Geon. In 936, Later Baekje fell to Goryeo. Thus, Wang Geon unified the Later Three Kingdoms on the Korean Peninsula. Goryeo adopted Confucianism as its political ideology and established an effective education system by founding the Gukjagam (a national higher education institution) and numerous hyanggyo (local private schools). Buddhism also exerted a considerable influence on Goryeo society in general. The Kingdom adopted a more tolerant approach towards the acceptance of other religions, as indicated by the Yeondeunghoe (Lotus Lantern Festival) and Palgwanhoe (Festival of the Eight Vows), rites in which prayers were offered for blessing, based on a syncretic mix of folk religions and Buddhism. Goryeo engaged in brisk trade with many countries, including Song China. Many traders from Song China, Central Asia, Arabia, Southeast Asia and Japan travelled to Byeongnando, the gateway to the capital, Gaeseong. The jade green celadon ware represents the ceramics of the Goryeo period. The exquisite patterns on these objects were created by inlaying white and black clay into grooves etched on their surface. Inlaid designs such as this are recognized as a unique skill. Traders from Song China sold satin, silk and medicinal herbs, while traders from Goryeo sold hemp cloth and ginseng. Gems such as ivory, crystal, amber were imported from Arabia. And, finally, the name ‘Korea’ originated from Goryeo during this period. The Goryeo Kingdom gave birth to a splendid culture. The inlaid designs found on Goryeo jade-green porcelain attest to a unique artistry unparalleled elsewhere in the world at that time. The Tripitaka Koreana (a Korean collection of the Tripitaka, or Buddhist scriptures, carved onto 81,258 wooden printing blocks), which was made during the Goryeo Period, is the essence of Buddhist culture and the pinnacle of achievement of wooden printing block technology. The world’s first metal printing types were also invented during the Goryeo Period. According to the pertinent records, the people of Goryeo invented metal printing types more than 200 years before Johannes Gutenburg in Europe. A book entitled Jikji (Anthology of Great Buddhist Priests’ Zen Teachings) was printed in 1377 with metal printing types, 78 years ahead of its European homologue printed in 1455. Jikji is kept at the National Library of France and was registered as a Memory of the World in 2001. In the early 13th century, the situation in China changed abruptly. The Mongols conquered the Jin Dynasty of China and expanded their influence into the Korean Peninsula. They invaded Goryeo seven times between 1231 and 1259. In an effort to resist these attacks, Goryeo moved its capital to Ganghwa. Even ordinary people and slaves fought the invaders. In 1259, a peace agreement was signed between the two countries. The Yuan Dynasty of China established by the Mongols accepted Goryeo’s six conditions for peace, including a guarantee of the continued existence of the Goryeo Dynasty and Mongol troops’ immediate withdrawal from the Korean Peninsula. The agreement was a result of Goryeo’s persistent resistance to the Mongols’ plan to bring Goryeo under its direct control. Despite the agreement with the Mongols, a group of Goryeo troops continued to fight them, moving their base of operations to Jindo and then to Jejudo. They continued to fight until 1273. Their forty-two-year campaign of resistance against the Mongols, the world’s strongest power at that time, attests to their perseverance and indomitable spirit. However, the national land was devastated and people’s lives were destroyed due to the long years of war. The Mongols destroyed many precious cultural heritages, including the nine-tier pagoda at Hwangnyongsa Temple. Towards the end of the 14th century, Goryeo found itself in a difficult situation due to internal and external problems, including a struggle for power among the nobility and incursions by red-turbaned bandits and Wako pirates. At that time, General Yi Seong-gye had become popular among the people for his role in driving away foreign invaders. He overthrew the Goryeo Dynasty and founded a new dynasty, Joseon. As the first King Taejo of Joseon, he chose Hanyang (present-day Seoul) – judged to be a propitious spot according to the principles of feng shui – as the capital of the new dynasty. He also ordered the construction of Gyeongbokgung Palace and Jongmyo Shrine, as well as roads and markets. The new capital, located in the center of the Korean Peninsula, was easily accessible via the Hangang River, which flowed directly through its heart. King Taejong, the third King and a son of the founder of the dynasty, made a significant contribution to stabilizing the system of governance. He adopted a system by which all people were registered under the Hopae Act, and launched six ministries, namely, the Ministries of Personnel Administration, Finance, Protocol, Defense, Justice, and Public Works, to govern the country. King Sejong, the fourth King and a son of King Taejong, ushered in an era of great political, social, and cultural prosperity. Scholars at the Jiphyeonjeon (Hall of Worthies) developed strong and effective policies. During the reigns of Sejo, Yejong, and Seongjong, the Gyeongguk daejeon (National Code) was drawn up with the aim of establishing a long-lasting ruling system. Koreans had used Chinese characters as their alphabet and writing system for many centuries. Idu and Hyangchal, systems for writing the spoken word, using Chinese characters, had been developed, but they left much to be desired. In 1443, King Sejong supervised the creation of Hangeul (the Korean alphabet) and promulgated it to the people three years later, in 1446. The shapes of the Korean alphabet were based on the shapes made by the human vocal apparatus during pronunciation. Many scholars have stated that Hangeul is the most scientific and easy-to-learn writing system in the world. It certainly went a long way towards enhancing communication between the people and the government, and played a decisive role in laying the foundations of a culturally advanced country. During the Joseon period, the country’s science and technology developed considerably. The Jagyeongnu (clepsydra), Angbuilgu (sun dial), and Honcheonui (armillary sphere) were all invented in the early period of the dynasty. A rain gauge, the first of its particular kind in the world, was used. Devices for land survey and mapmaking were also made. During the reign of King Taejo, the Cheonsang yeolcha bunya jido (Celestial Chart) was made based on a previous version drawn up during the Goguryeo Period. During the reign of King Sejong, Chiljeongsan (Calculation of the Motions of the Seven Celestial Determinants) was made based on the Shoushili calendar of China and the Islamic calendar of Arabia. Noticeable advances were made in the sphere of medical science. Hyangyak jipseongbang (Compilation of Native Korea Prescriptions) and Uibang yuchi (Classified Collection of Medical Prescriptions) were compiled. Metal printing types, such as Gyemija and Gabinja, were made during the reigns of Taejong and Sejong, making it possible to publish many books. Joseon maintained friendly relations with Ming China. The two countries exchanged royal envoys every year and engaged in busy cultural and economic exchanges. Joseon also accepted Japan’s request for bilateral trade by opening the ports of Busan, Jinhae, and Ulsan. In 1443, Joseon signed an agreement with the Tsushima Clan Leader of Japan for bilateral trade. Joseon also traded with Asian countries, such as Ryukyu, Siam, and Java. Chinaware is perhaps the most representative handcraft of the Joseon Period. Grayish-blue-powdered celadon or white porcelain was widely used at the Royal Court or government offices. By about the 16th century, Joseon’s chinaware production skills had reached their zenith. Its white porcelain typically exhibited clean, plain shapes based on the tradition established during the Goryeo Period. They were suited to the aristocratic taste of the Confucian scholars. This astronomical chart from Joseon shows the constellations. Throughout the 14th and 15th centuries, Joseon maintained good relations with Japan. In the 16th century, however, Japan called for a larger share of the bilateral trade, but Joseon refused to comply with the request. Japanese threw the country into turmoil by causing disturbances in 1510 and 1555. In Japan, Toyotomi Hideyoshi brought the confusion of the 120-year-long Warring States Period to a conclusion and unified the country. Then, in 1592, he invaded Joseon with around 200,000 troops, with the aim of dissipating local lords’ strength and stabilizing his rule in Japan. The war lasted until 1598. Feeling threatened by the invading Japanese troops, King Seonjo of Joseon fled to Uiju, close to Ming China, and asked the Ming to come to his aid. The Japanese invaders marched into the northern provinces of Joseon. Korean militias started fighting the invaders here and there across the country. It is particularly noteworthy that Korean naval forces led by Admiral Yi Sun-sin won one victory after another against the invaders and defended the nation’s breadbasket in Jeolla-do Province. The Japanese forces pulled out of Korea, but invaded Joseon again in 1597. Although Admiral Yi Sun-sin was left with only thirteen warships, he won a devastating victory against the Japanese fleet of 133 ships. The sea battle waged in the Strait of Myeongnyang was one of the greatest military engagements of all time, and is surely worthy of inclusion in any record of the world history of naval battles. This vase made in the early Joseon Period displays a uniquely Korean atmosphere in its refined portrayal of bamboo, plum, and birds. Following the death of Toyotomi Hideyoshi, the Japanese invaders returned home. During the seven-year war, many cultural heritages in Joseon, including Bulguksa Temple, were destroyed. The Japanese took away books, printing types, and works of art from Joseon. With these spoils of war, the Japanese were able to enhance scholarship and the arts in their own country, while porcelain makers whom the Japanese troops abducted from Joseon helped Japan develop its own china culture. In the late Joseon Period, commerce and industry entered a period of rapid development. Many children could receive education at private schools in their local neighborhood. With these improvements in the quality of life of the people, they began to enjoy diverse entertainments. Stories written in easily understood Hangeul, as opposed to literary works published in Chinese, were widely distributed. Pansori (a genre of musical storytelling) and mask dance developed. In the late 19th century, Sin Jae-hyo arranged pansori saseol (stories). Five leading pansori songs, namely, Chunhyangga (The Song of Chunhyang), Simcheongga (The Song of Sim Cheong), Heungboga (The Song of Heungbo), Jeokbyeokga (The Song of Red Cliff), and Sugungga (The Song of the Rabbit and the Turtle) have been handed down to the present day. Mask plays such as Tallori and Sandaenori enjoyed great popularity among ordinary people. This is a type of traditional stage play, in which masked actors and actresses engage in gags, dances, songs, etc. The Fall of Joseon: Imperial Japan’s Annexation of Korea With the onset of the Industrial Revolution in the 18th century, capitalism developed in Europe and large businesses came into being. European countries expanded their colonies in Asia and Africa. By the mid-19th century, the western powers had forced Qing China and Japan to open their doors and then asked the same of Joseon, but Joseon duly rejected such requests. Joseon did not yield to pressure applied in the form of naval attacks in 1866 (by the French) and 1871 (by the Americans). In the ensuing period, the western powers did not stop exerting pressure. 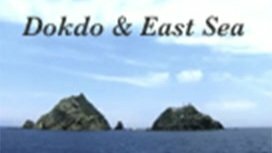 In 1875, Japan dispatched the battleship Unyo Maru to attack Ganghwado and Yeongjongdo Islands, demanding that Joseon open its doors to foreign trade missions. Ultimately, Joseon was forced to sign the highly unequal, one-sided Ganghwado Treaty with Japan in 1876 under the threat of force. Subsequently, imperialist powers, including Japan, vied with each other to pillage Joseon’s resources. In 1897, Joseon changed its name to Imperial Korea and pushed ahead with reforms and the open-door policy, but it was too late. Japan soon won major victories in its wars against Qing China and Russia, emerged as a strong power in Northeast Asia, and took steps to annex Joseon. Many Korean patriots, including Ahn Jung-geun, resisted such a plan, but to no avail. In August 1910, Imperial Korea became a Japanese colony. During the colonial period (1910-1945), the Japanese pillaged Joseon’s resources, banned the use of the Korean language - even going so far in 1939 as to require Koreans to change their personal names to Japanese style surnames and given names under the Name Order, and conscripted Koreans into their work force or as uniformed soldiers in the Pacific War. Koreans engaged in persistent struggles to regain their independence. They organized clandestine organizations to fight the Japanese within the country. They also established forward bases for the independence movement in China, Russia, and the United States and led unprecedentedly peaceful demonstration. In March 1919, Korean leaders announced the Declaration of Independence. Students and ordinary people joined them by staging street demonstrations across the country. These protests continued for 12 months, involving about 2 million people, and were violently suppressed by the Japanese, with many thousands killed and wounded. The movement spread to the Koreans resisting in Manchuria, the Maritime Provinces of Siberia, the United States, Europe, and even to Japan. Following the March 1919 Independence Movement, organizations representing Koreans were established in Seoul, the Maritime Provinces of Siberia, and Shanghai. The Provisional Government of Korea established in Shanghai was the country’s first democratic republican government; it was equipped with a modern Constitution and a political system that separated the three basic branches (executive, legislative and judicial) of government. They played a pivotal role in the independence movement between April 1919, when the Provisional Government was established in Shanghai, China, and the country’s liberation in August 1945. Koreans also carried out armed struggles against the Japanese. In the 1920s, more than thirty Korean independence army units engaged in resistance activities in Manchuria and the Maritime Provinces of Siberia. In June 1920, a Korean independence army unit led by Hong Beom-do dealt a devastating blow to Japanese troops in Fengwutung, Jilin Province, China. In October 1920, Korean volunteers led by Kim Jwa-jin won a great victory against Japanese troops in Helongxian, Manchuria. This is known as the Battle of Cheongsalli among Koreans. In 1940, the Provisional Government of Korea (PGK) organized the Korean Liberation Army in Chungqing, integrating many scattered volunteer independence fighters in Manchuria. The PGK declared war against Japan and dispatched troops to the front lines in India and Myanmar to fight on the side of the Allied Forces. Some young Koreans received special training from a special military unit of the United States to better equip them to attack Japanese forces in Korea. On August 15, 1945, Koreans finally received what they had looked forward to for so long: the country’s liberation as a result of Japan’s surrender in the Pacific War. U.S. and Soviet troops were deployed to the south and north of the 38th parallel, respectively to disarm Japanese troops remaining on the Korean Peninsula. In May 1948, the country’s first democratic election was held in South Korea under the UN’s supervision to elect the 198 members of the National Assembly. In July of the same year, the Constitution was enacted and Rhee Syngman and Yi Si-yeong, two independence fighters deeply respected by Koreans, were elected as the country’s first President and Vice President. On August 15, 1948, the Republic of Korea (ROK) was launched as a free democracy, inheriting the legitimacy of the PGK. The UN recognized the government of the ROK as the only legitimate government on the Korean Peninsula. However, to the north of the 38th parallel, a general election under UN supervision could not be carried out due to the Soviet Union’s opposition. On September 9, 1945, the Democratic People’s Republic of Korea (DPRK) was established as a communist country, and Kim Il-sung, who had served as an officer of the Soviet Russian Army, was sworn in as the President. Amid the confrontation between a free democracy in the south and a communist dictatorship in the north, the ROK government led by President Rhee Syngman was burdened with many problems, such as the establishment of domestic order, the elimination of any remaining traces of the colonial rule, and conflicts between the right and the left among others. On June 25, 1950, North Korean troops armed with Soviet-made tanks and fighters invaded the South, thus triggering an all-out war. The UN Security Council unanimously condemned the North Korean invasion and published a resolution recommending that its member states provide military assistance to South Korea. When the tide of the war turned against the North with the intervention of the UN Forces, Red Chinese troops intervened in the war on the North’s side. The two sides engaged in fierce battles until, on July 27, 1953, the two sides finally signed the armistice agreement. President Rhee Syngman did not sign the agreement, calling strongly for the prolongation of the war with the goal of unifying the entire country in the South’s favor. Korea’s first national expressway connecting Seoul and Busan was opened in 1970. The three-year-long internecine war started by the Communists reduced the entire Korean Peninsula to rubble. Millions of troops and civilians were killed. Most of the country’s industrial facilities were destroyed. South Korea became the poorest country in the world. However, the war taught South Koreans the preciousness of freedom. The experience provided the foundation that inspired patriotism in the hearts of young students and uniformed soldiers alike, and became the principal engine of the country’s modernization. President Rhee Syngman strengthened his authoritarian rule. In 1960, the ruling Liberal Party rigged the Presidential election. Young students took to the streets in protest. The situation deteriorated when many demonstrators were shot down by the police. President Rhee Syngman announced his stepdown and took refuge in Hawaii. Shortly thereafter, the Constitution was amended, and the Cabinet system and the bicameral National Assembly were adopted. Under the new constitution, the regime led by Prime Minister Jang Myeon was launched, but the political situation became extremely fragile amid political struggles and continued street demonstrations by students. In May 1961, a group of young army officers led by General Park Chunghee seized power in a coup d’état. In the presidential election held in October 1963, after two years of military rule, Park Chung-hee, having retired from the military, was elected as President and inaugurated in December that same year. The government led by President Park set up a 5-year economic development plan under the slogan of “modernization of the fatherland” and achieved rapid economic growth by implementing an export-oriented policy. Observers called it “the Miracle on the Hangang River.” The country vigorously pushed ahead with the development of national land, including the construction of the Gyeongbu Expressway and subway lines in large cities. The country also carried out the Saemaeul Undong (New Community Movement), turning the impoverished agricultural society into a country focused mainly on manufacturing. Since the South Korean government was established in 1948, the country has transformed itself from one of the most impoverished countries in the world to an economic powerhouse and an exemplar of free democracy. When the government announced the Yusin (Revitalization Reform), which were designed to extend the term of the incumbent government after eighteen years of dictatorship, in October 1972, students and ordinary people engaged in the democratization movement. After the assassination of President Park in October 1979, a new group of army officers led by General Chun Doo-hwan (Singunbu) seized power through a coup d’état. Singunbu suppressed the voices calling for democratization, including the May 18 Democratization Movement, by force. Chun Doo-hwan was sworn in as the President and ruled with an authoritarian grip. The Chun Doohwan government concentrated on economic stabilization, successfully bringing inflated prices under control. Under his leadership, the country accomplished continued economic growth. In June 1987, Roh Tae-woo, a presidential hopeful of the ruling party, made a special announcement to the effect that he would accept the people’s request for democratization and direct election of the President. In December of the same year, he was elected to a five-year term as President. He was sworn in as President in February 1988. The Roh Tae-woo administration established diplomatic relations with Communist countries, including the Soviet Union, China, and those in Eastern Europe. During his term, the two Koreas joined the UN simultaneously, in September 1991. The Kim Young-sam government, which was inaugurated in 1993, strove to eliminate corruption by making it a rule for high-ranking public officials to register all their assets and by prohibiting the use of false names in all financial transactions. The level of transparency in business transactions was considerably enhanced by this measure. The government also implemented the local autonomy system in full force. Kim Dae-jung was inaugurated as President in 1998. His government succeeded in overcoming the foreign exchange crisis that had hit the country one year earlier, and strove to develop both democracy and the market economy. In its relations with the North, the government adopted the “sunshine policy.” In June 2000, the leaders of the two Koreas met at a summit held in Pyeongyang, North Korea, and made a joint statement. Then, the two Koreas established a system of reconciliation and cooperation, and agreed on the reunion of dispersed family members, reconnection of the Gyeongui and Donghae railroad lines, revitalization of the unification movement led by the private sector, and the expansion of economic cooperation, including sightseeing in Geumgangsan Mountain. The Roh Moo-hyun government, which was inaugurated in 2003, concentrated on three leading objectives, namely, the realization of democracy with the participation of the people, balanced social development, and the construction of Northeast Asia with the focus on peace and prosperity. The government also held the second summit between the leaders of the two Koreas in Pyeongyang in October 2007 and signed an FTA with the United States. The Lee Myung-bak administration, which was inaugurated in 2008, announced five leading indicators in a bid for the establishment of a new development system with the focus on changes and practicality. The government stressed that it would be a government that would serve the people. It also made efforts to reduce the government organization, privatize public corporations (in addition to making them operate more efficiently), and reform administrative regulation. Other policies adopted by the government included the forging of a creative alliance with the United States as befits the 21st century, and the creation of a global Korea under the South-North Economic Community. In May 2017, Moon was sworn in as the 19th president of the Republic of Korea. Stressing the need for “national unity,” President Moon Jae-in pledged that his government will pursue fairness and cooperation, reform and change, dialog and communication, and competence and expertise. Moreover, the Moon Jae-in administration has paved the way to ease tension on the Korean peninsula and open an era of peace by holding inter-Korean summits as well as South Korea – US and South Korea – China summits. In the face of the Fourth Industrial Revolution, the government has also focused on building infrastructure, improving related regulations, and securing key technologies for future generations.